Although the Bo Ginn Fish Hatchery has been idle for many years, the Georgia Southern Department of Biology will soon put it to use to conduct cutting-edge research. The Department signed a memorandum of understanding with the U.S. Fish & Wildlife Service (USFWS) to allow University biology students and faculty to use the facility, located in Magnolia Springs near Millen, Georgia, as a resource to better understand the future of ecosystems in the southeastern U.S.
Lance McBrayer, associate dean for Research in the College of Science and Mathematics, said the University is excited to work with the USFWS. Associate Professor of biology Checo Colon-Gaud, Ph.D., is leading the initial work at the site. He believes the hatchery is the perfect place to conduct research in the area. 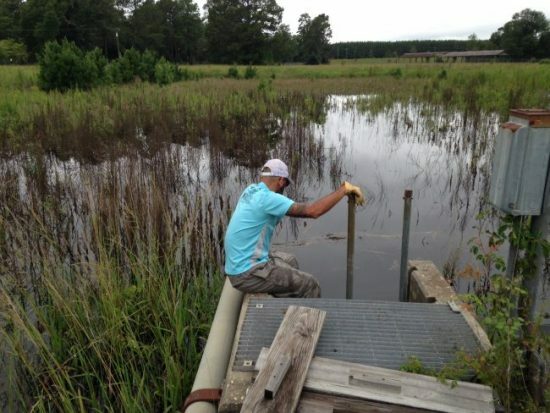 “The many impoundments at the site, which can be filled with water or drained as needed, offer a perfect setting for experiments in aquatic ecology,” said Colon-Gaud. Most of the experiments will address a basic prediction of climate change. Ephemeral ponds, those that fill from rainfall but dry out weeks or months later, are vital habitats for many species in the southeastern U.S. Yet, changes in rainfall due to climate change are expected to cause these ponds to fill for shorter periods of time or to hold water less predictably. Colon-Gaud and others will conduct experiments to quantify the impacts of such changes on aquatic life. The significance of these ephemeral ponds extends well beyond the water’s edge. Many insects that start life as aquatic larvae become adults that leave the pond and move into surrounding fields and forests. There they become an important food source for terrestrial animals such as reptiles and birds. “Although we are studying the ecology of ephemeral ponds, this may be the key to the health of surrounding forests,” said Colon-Gaud. This article was originally posted by the Georgia Southern Newsroom and can be found here.